I must admit, freely, that when I sit down a few days after a BMWRO group ride to write the ride report I ask myself, “Will anybody ever read this?” And then, I think, well the people that attended the ride surely will, or will they? Then the pressure begins to mount…. I think, if they read this will they want me to say something witty, or profound? O.K. Doug, and Tim…. This ride report will be neither of those two items. Let’s get that out there now. As a co-ambassador for this organization, I love to ride, and as such, being charged with organizing group rides is right up my alley. My greatest fear is that I will organize a ride and a dozen people will show up. A potential people management nightmare. However, that never happens, and last Saturday a very manageable two people showed up. 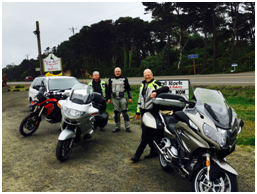 Even a weather forecast of stellar proportions, and the promise of pub food, could not motivate people to fulfill the prime directive: BMW Riders of O. My only guess is that there were some really long “honey-do” lists that probably involved 3 or 4 trips to the hardware store to fix one leaking fixture! You know who you are.. yes, my hand is up too. Doug Tewksbury and Tim Cruse making tracks near Alsea. No one could possibly ask for better riding weather as we left European Motorcycles of Western Oregon in Eugene. 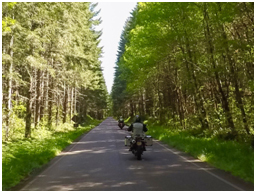 We made our way up Philomath Oregon via the scenic back roads from Monroe. Once we arrived in Philomath, we turned west on Highway 20 on our way to Newport. Experience dictates that when in Philomath pay strict attention to speed limits. Ah, yes, there is obligatory radar speed trap. Never fails. Lunch was a Nana’s Irish Pub near Nye Beach in Newport. Good food, judging not only by what was on our plates, but also that the place went from empty to full in minutes! 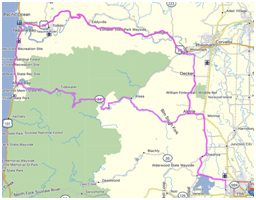 The return trip took us on Highway 34 through Alsea, to Alsea falls, and then back to Monroe. All-in all it was on great ride on a very good day!